Early spring brings visitors to Neosho for the annual dogwood tour as six species of dogwood occur naturally in Missouri and are abundantly displayed throughout Neosho. Then again, fall is another pretty time of the year in Neosho. The wide varieties of hardwood trees turn stunning colors that leave the resident and visitor alike in awe of Mother Nature's splendor. Neosho, a county seat town of 10,500 is located in Newton County on the western edge of the Missouri Ozarks. The name, Ne-o-zho or Ne-u-zhu, is of Indian derivation meaning "clear or abundant water." The nine springs within the city limits played an important part in the early development of Neosho. 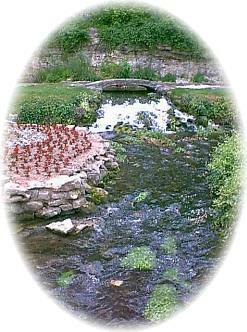 Spring Park is one of Neosho's main attractions with springs streaming by six rose gardens and a trout pond where all can enjoy feeding the fish. Neosho, nationally known as the Flower Box City, received a grant in 1955 to launch an experiment in city beautification, and has since concentrated on easy care planters in every conceivable location. Flower boxes in front of business establishments, churches, schools and residential homes have spread Neosho's fame. The project is so much an accepted part of the city's thinking that many new residences and businesses have flower boxes incorporated as part of their landscaping plans. We are now proud to be home of the world's largest flower box. In addition to beauty, four prominent American figures are tied to Newton County, three of them born here and the other one settled on a farm here and completed his most important work. Thomas Hart Benton, George Washington Carver, James Scott, and Herman Jaeger have been nationally recognized for their contributions to the arts and sciences of a growing nation. Along with details about the works of these men, historical materials about the area are displayed at the Newton County Historical Museum and the Longwell Museum at Crowder College. On McKinney Street is the U.S. Fish Hatchery, the oldest one in the United States. Specialty shops, food, lodging, and of course, Missouri's largest Garage Sale brings thousands of people to Neosho on the first Saturday in April. Come and enjoy our year-round beauty, activities, and hospitality!